Adge Marziano speaks in East Coast speed with a bona fide smile that never leaves her lips. In her life, she feels she has much to be happy and thankful for. Adge would be using her hands fully as part of her expressive Italian-American mannerisms if she weren’t cradling her miracle baby daughter—the doctors said she’d never be able to have. “I was this past Vinotok’s Harvest Mother,” Adge says proudly of the well-loved, uniquely Crested Butte celebration. 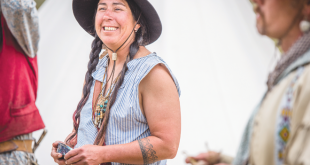 “I never thought I would actually be the Harvest Mother because I was not supposed to even be able to get pregnant on a physical and medical level but I started doing intensive acupuncture when faced with a medical scenario that came up in the fall 2013,” she explains. A short time later an ultra sound showed the little bubble that became Galena Mabon, auspiciously born at 10:10 a.m. on exactly the autumnal equinox and during a new moon. Mabon is the name given to the ancient autumnal equinox yearly thanksgiving celebration that falls towards the end of September. She began as a tiny dancer, at a very young two-and-a-half years old, when she and her mom happened to walk by a studio. Adge was mesmerized by the movement. “I wanted to go in and watch and then, that was it, I wanted to dance. There was no stopping me!” she says. Her mother signed her up right there. “Dancing was my life growing up,” she recalls, and throughout her teens she traveled and competed before graduating from high school in 1999. After her first year at Arcadia University in Philadelphia, and after a summer, fall, and into the winter working at the Jersey shore, in early January she and a friend packed up the car and started driving. “I didn’t know where exactly but I knew I was going to Colorado. There, she earned an associate’s degree in science, before transferring to CSU to finish with a bachelor of science degree in anthropology and geology in 2005. That was the summer she decided to move to Crested Butte. 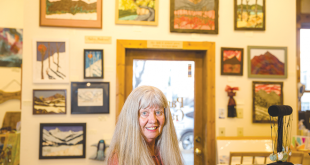 Furthering her education, Adge received her master’s degree in special education through the University of Phoenix, then worked for three years in Kersey, Colo., in a special education classroom specifically for emotionally disabled kids. She felt it was a big part of her calling. While teaching special education in both the Gunnison and Crested Butte schools, Adge signed up to take an advanced jazz dance class at the Crested Butte School of Dance. 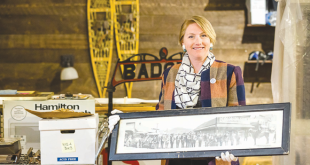 When her dance teacher decided to leave the country to travel, Heidi Frazier, a co-founder of the school, called to ask if Adge would like to teach the advanced jazz class. “I was ecstatic. It dawned on me right then that I had always wanted to be a teacher and had always danced but had never made the connection that eventually I would teach dance. I already had a lot of kids that I had babysat who were in the class. I had always used movement in my special ed classes because I felt that getting them up and moving was therapeutic,” she notes. It was 2006 and her dance instruction snowballed. “The next season I was on the schedule teaching several classes and from there it just kept going. When Heidi left I became the program director and then this year I became the executive director,” she says. Adge points out that her main focus is the Crested Butte School of Dance “It’s what I really do, I teach classes through there. I started the Crested Butte Dance Company as well, which is part of the school but different. It gives my dedicated dancers more of an opportunity to get dance experience outside of Crested Butte. We go to conventions and college expos all over and we’ve competed. We do more performances. I want them to feel prepared to try out for a college dance company or to be ready to continue their dance education,” Adge says of her goals for her students. As for her mommy-hood and husband, Adge notes, “I was never going to get married, never have a real job, never have a baby and never own a home and within one year, every single one of those things happened. I decided, okay, I surrender!” She laughs at the turn of events. She met her hubby, Rob Lindsey, at a party that she and KT threw in 2008 and he moved in as a roommate before they were even dating. Since they were on opposite schedules, they never saw each other. That eventually changed, they went out on a date and the rest is history.